Give Your Dad the Unique Gift of StubHub Tickets! I am so excited to share with you today one of the most unique, but yet, fun and personal Father's Day gift - the gift of tickets to a sporting event, concert, or other event of THEIR choice! 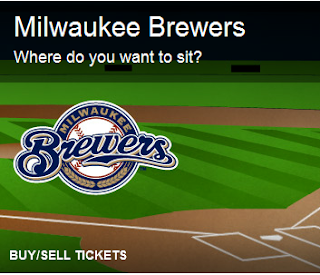 StubHub is the world’s largest ticket marketplace and they have got the perfect ticket for any father! If your father, husband, or special man in your life is a big sports fan, StubHub has got the perfect sporting event ticket packages. StubHub has teamed up with Premiere Global Sports to provide amazing event packages, designed to put you and Dad in the center of the action, with fantasy perks like VIP parties, preferred lodging, exclusive meet and greets, behind-the-scenes activities, and more. These packages would be perfect to take Dad to an experience he’ll never forget. For example, if Dad is a huge golf fan, they have packages for the 2012 U.S. Open in San Francisco, which would include overnight stays at the luxurious Hyatt Fisherman’s Wharf in San Francisco, as well as tickets to the event and transportation. As the final round of the tournament falls on Father’s Day, and what a great way to share that experience with him. If you’re on a budget or want to give Dad the freedom to choose his favorite event, then give him a StubHub gift certificate – you choose the price and Dad chooses the event. You can easily purchase gift certificates online, print a regular hard-copy gift certificate or send a gift announcement letting your dad know you have purchased tickets to his favorite game or concert. If you’re a last-minute shopper, don’t worry, StubHub reinvented the ticket space and created its FanProtect Guarantee, so tickets are guaranteed and often available until the very last minute before the event. With this in mind, you may want to consider purchasing tickets to a MLB game or take Dad to Broadway to see Magic/Bird, about his favorite basketball players and are timed perfectly with Father’s Day. I absolutely loved looking through their awesome selection of concerts, sporting events, and other fun events on the StubHub website. My husband was so excited to be able to pick ANY event he wants - he said it was one of his favorite Father's Day gifts ever! · Specifically for concerts and music events, you will get the lowest ticket prices if you buy 1-2 months prior to the event. · If Dad wants tickets to his favorite game, StubHub encourages last-minute ticket buying because prices often decrease right before game time. However, if Dad considers seating location a priority, he’ll want to purchase tickets sooner, as seat selection is always lower when buying last-minute. StubHub says give Dad something he can do, and a gift he’ll always remember, instead of ties or cufflinks that will just collect dust in his closet! 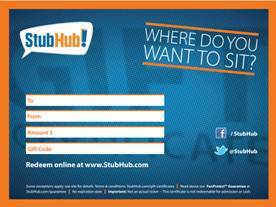 Buy It: Head to StubHub's website to buy tickets for your favorite Dad or to give him a StubHub gift certificate!